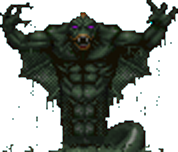 This article provides a few details about the monsters you face while playing Scattered Evil. These horrid creatures are all that remains of the once proud Legionnaires. Less than human, they retain just enough of their memory to hate what they have become, and to hate you even more for what you still are. Fortunately for you, they are not particularly skillful foes. The ranged version of ettin; shoots standard arrows, uses to evade melee combat when possible. 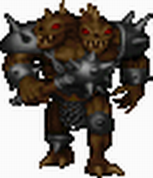 This ettin has an unlimited stock of explosive grenades similar to Fighter-style Flechettes, but with a significantly increased throwing range. They have enough smarts to roughly calculate speed and angle of the throw to get the bomb just to the target. When the enemy is close, the Ettin Flechetter sets a time bomb (similar to Mage-style Flechettes) at his location and backs away. This powerful creature is four times stronger than an ordinary Ettin. While it does a fair amount of damage in close combat, its main weapon is a magical throwing hammer in all ways equal to the Fighter’s Hammer of Retribution. This powerful creature is nearly five times stronger than an ordinary Ettin and fights with a magic sword in all ways equal to the Fighter’s Quietus. Thanks to superior leg muscles, it can also leap up to heights several times its own height. This giant monstrosity shuffles slowly across the battleground, but if you let it close in on you, it will squish you with brutal efficiency. Named after a mythical being, these monsters bear none of the pleasant traits attributed to them in legends. Instead, they are vicious, brutal, and extremely hard to kill. Centaurs serve in the front ranks of many of the Serpent Riders’ armies. They are capable of deflecting missiles with their shields, so use caution when attacking them. These Centaur leaders are much like their minions, but they’re considerably tougher and they can spew bolts of magical energy from their shields. So we won’t say anything about their apt name. Your safest strategy is to attack them from afar as they tend to do the same. These are the next generation of Slaughtaurs; while they inherited their predecessors’ magic missile attack, Spectral Centaurs also attained some more powerful abilities. They possess a ghostly form that makes them invulnerable to many kinds of missile attacks and less visible. When attacking or defending they may perform a “blur evasion” move similar to a Dark Bishop’s, sometimes even several times in a row. This kind of Centaur has traded the original Slaughtaur’s attack for something hotter. Instead of shooting blue magic missiles, Flame Centaurs attack their target either by launching up to dozen of fiery projectiles or casting forth a wave of ground flames. They possess a ghostly form that makes them invulnerable to many kinds of missile attacks and less visible. They spew forth ghosts that seek their target with deadly accuracy. Thanks to superior leg muscles, they can also leap up to heights several times their own height. These beasts breath fireballs at you from the distance and bite your face off if you let them get close to you. These beasts breath gobs of poison at you from the distance and bite your face off if you let them get close to you. Breathing fire is so last year. These beasts instead cough up several shards of boiling hot magma that seek their target over large distances. Thanks to superior leg muscles, they can also leap up to heights several times their own height. Many of the more powerful leaders within the Church have been warped into mindless servants of the Serpent Riders, and their magical powers have been multiplied tenfold. These vile creatures are known as Dark Bishops, and though they are frail of limb, they are extremely powerful. They fire circling projectiles of magical jade that track your position, and the Bishop phases in and out of existence as they travel from place to place. A dangerous opponent by itself, a nightmare when encountered in groups. Decreasing chance to resurrect after each death restoring a decreasing portion of its maximum health: 100% chance with 100% health after first death, 50% chance with 50% health after second death, 33% chance with 33% health after third death and so on. Dark Cardinals are more powerful versions of the Dark Bishop. They shoot fiery red projectiles with an advanced homing ability. They teleport instead of the standard bishop evasive action, thus the opponent won’t always know where they will reappear. Lastly, they have a chance to resurrect after death. Unlike the Dark Cardinal, this ominous creature is not just an upgrade, but rather a boss of its kind. It has two types of common attacks, including fast white projectiles with high homing ability and arcs of small golden missiles shot in waves. The spell Kinetic Shield protects him from most ranged weapons (except for a few extremely fast ones and those with a special attack style); the spell Golden Storm summons a continuous rain of golden drops following his enemy; he has an ability to conjure 1-3 Dark Bishops or Cardinals; and the spell Mirror Image summons 1-3 illusionary clones of the Dark Cardinal that cannot cast spells but can use all standard attacks. You thought they were rare and special snowflakes – until you started playing Scattered Evil. 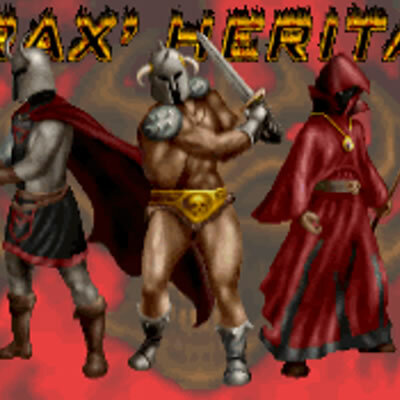 You thought the Heresiarch was tough. Then you met his big brother. These larger, nastier cousins of the gargoyles found in Heretic are more than happy to douse you in flames. The only nice thing about them is the satisfying splat they make when you shoot ’em from the sky. 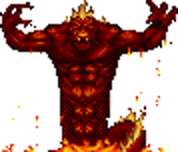 Afrit Leaders are larger and tougher versions of the original fire demon and able to shoot five projectiles in a row instead of three. They can also curl up in a ball, becoming invulnerable for a short time. These fire demons have weak health but are very dangerous. When seeing an enemy, they transform into a burning cannonball and launch themselves at the target. As soon as they reach the immediate vicinity of their designated victim, they explode, sacrificing themselves and delivering heavy damage to everyone nearby. Tattered wings propelling a fire breathing monster, bearing down upon you from the skies. Stalkers are aquatic reptiles with huge talons designed to rend their prey into bite-sized morsels. They can’t leave the water, so once you’re on dry land you might feel safe. This kind of Stalker is identical to the common one, except that they also can fire slime projectiles. Liquid fire flows inside these creatures’ veins and hardest hide covers their body, allowing them to endure the heat of lava, where they tend to live. In most they are similar to ordinary stalkers if not their reddish colour and ability to shoot fire projectiles like afrits do. Although they retain only half of their bodies, these undead creatures have lost none of their powers. They fly through the air with hypnotic grace, but don’t just sit there and watch or they’ll pelt you with devastating fireballs. Not only bigger and stronger than a regular Reiver, the Specter can also cast a Terror Spell on you, making you cower in fear, throwing down your weapon and covering your eyes. Not even fleeing to another part of a dungeon will let you gather your wits in peace, as it will follow you through walls and closed doors. The Ghost is not a powerful enemy, but it has a high annoyance factor. It is very fast and posseses an amazing ability to fly through walls (literally!) and once disturbed will pursue the player everywhere he goes. You can never feel safe if there are ghosts around, and you rarely can guess which direction they will come from. Made entirely of ice, these animated hunks feel nothing but rage and hate. Lava Dwellers are golems, created by magic. They look like a large, roughly cut obsidian head with fiery streaks all around them. Unable to move around, they usually hide underground or in lava, ready to emerge as soon as an enemy comes into their sight (or rather range of sense). They then attack him or her, spitting powerful fireballs from their mouths. When heavily damaged, Lava Dwellers may submerge temporarily to restore their health. Several Dwellers placed in right positions may act as a heavy defence system, so wannabe heroes should watch out. It looks like just like small clouds of steam or mist rising from the ice, but when entering its cloud breathing becomes difficult and you soon turn to ice. It looks just like ordinary mist floating above the murky waters of a swamp – until you step into it and choke to death.